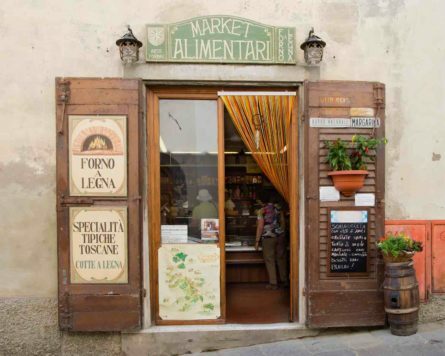 Panzano’s greatest attraction is the shop and restaurant of the world’s favorite butcher, Dario Cecchini, and eating there is an experience not to be missed. This Panzano day trip begins with a tour of the vineyard, wine cellar, and olive press of a boutique producer in Chianti, followed by a guided tasting of their top shelf wines and exquisite extra virgin olive oil. The day then continues first at Dario’s butcher shop, where guests will be greeted by the cheerful staff waiting to welcome customers with wine glasses in hand and on most days by Dario himself who is in his glory behind the butcher counter. From the shop, participants are then led to the restaurant for an unforgettable multi-course meal capable of turning even non-meat-lovers into carnivores.